and the many things,.....big and small, that we can do to help. Here is a recycling project that I hope you enjoy. any other kind of box you can recycle. Adhere masking tape along the opening and around the box. This will make the piece a bit stronger. use Mod Podge® to adhere pieces of book pages to the box. Paint the box any color of your choice. Add more paint, collage items, rubber stamping, or doodling to the box. 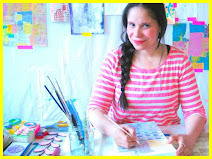 of your original art work and adhere it with Mod Podge®. OMG this is soooo COOL! How clever - and I just happen to have a bunch of those soap boxes! Thanks for a groovy idea! and Happy Earth Day!!! Alma, thank you!! Wonderful boxes! It is pure joy and play :) Militsa. i love the whimsical people, great recycling idea. OMG you're such an inspiration and this is crazy good tutorial !!!!!!!!! LOVE IT, thanks so much for these fantastic ideas !!!! what a truly wonderful idea!! I'll definitly keep this in mind next time I run out of canvas! nice idea. i use a version of this as a "worry box." it holds the slips of paper worries so the person doesn't have to. (I'm a psychotherapist). of course, it requires the box to be open-able so that processing the worries takes place eventually! FUN!!! Thanks for sharing this. Love this!! Thanks for the clever idea! This is such a great idea, I've been trying to come up with ways to use all of the "book guts" I have... I can't wait to give it a try!!! Thanks so much for sharing! Mahalo, Alma, for an EZPZ prep of boxes as canvas. I knew those soap, powdered beverage, & other little boxes would be fortuitous. Ho I love this idea!! I will try it out, what a cool way to recycle and make art at the same time!! Love your collage style by the way! Alma, these are just adorable! So whimsical! SO fun - I love your characters. They are super cool! Love the color palette too. Great idea! Saw you on Mod Podge Rocks today! This is so wonderful! Thanks for sharing such a thrifty idea. Your work is stunning! Beautiful work...saw you on Modge Podge Rocks! Thanks for the idea, I'm going to use this for a kids craft group I lead at an apartment village for formerly homeless families. hooray! I have a stupid number of bandaid, sultana and museli bar boxes just waiting to be turned into crafty goodness..you just gave them their destiny! Sooo podging on family photos and stuff. woot! What a wonderful, green idea! I love it! I just saw your tutorial yesterday and already have a boxed taped ready to go. Can't wait to get to the painting. What a great idea! this has given me more ideas, too! Thanks for showing your blocks made with great pictures! You could also add sand inside, to give it some weight; then it could also be used as a paper weight.